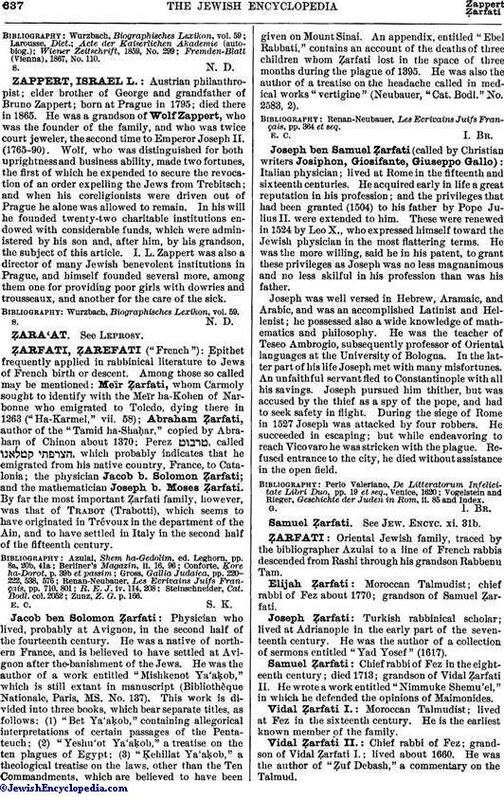 Epithet frequently applied in rabbinical literature to Jews of French birth or descent. Among those so called may be mentioned: Meïr Ẓarfati, whom Carmoly sought to identify with the Meïr ha-Kohen of Narbonne who emigrated to Toledo, dying there in 1263 ("Ha-Karmel," vii. 58); Abraham Ẓarfati, author of the "Tamid ha-Shaḥar," copied by Abraham of Chinon about 1370; Perez , called , which probably indicates that he emigrated from his native country, France, to Catalonia; the physician Jacob b. Solomon Ẓarfati; and the mathematician Joseph b. Moses Ẓarfati. By far the most important Ẓarfati family, however, was that of Trabot (Trabotti), which seems to have originated in Trévoux in the department of the Ain, and to have settled in Italy in the second half of the fifteenth century. Zunz, Z. G. p. 166. Physician who lived, probably at Avignon, in the second half of the fourteenth century. He was a native of northern France, and is believed to have settled at Avignon after the banishment of the Jews. He was the author of a work entitled "Mishkenot Ya'aḳob," which is still extant in manuscript (Bibliothèque Nationale, Paris, MS. No. 137). This work is divided into three books, which bear separate titles, as follows: (1) "Bet Ya'aḳob," containing allegorical interpretations of certain passages of the Pentateuch; (2) "Yeshu'ot Ya'aḳob," a treatise on the ten plagues of Egypt; (3) "Ḳehillat Ya'aḳob," a theological treatise on the laws, other than the Ten Commandments, which are believed to have been given on Mount Sinai. An appendix, entitled "Ebel Rabbati," contains an account of the deaths of three children whom Ẓarfati lost in the space of three months during the plague of 1395. He was also the author of a treatise on the headache called in medical works "vertigine" (Neubauer, "Cat. Bodl." No. 2583, 2). Renan-Neubauer, Les Ecrivains Juifs Français, pp. 364 et seq. Italian physician; lived at Rome in the fifteenth and sixteenth centuries. He acquired early in life a great reputation in his profession; and the privileges that had been granted (1504) to his father by Pope Julius II. were extended to him. These were renewed in 1524 by Leo X., who expressed himself toward the Jewish physician in the most flattering terms. He was the more willing, said he in his patent, to grant these privileges as Joseph was no less magnanimous and no less skilful in his profession than was his father. Joseph was well versed in Hebrew, Aramaic, and Arabic, and was an accomplished Latinist and Hellenist; he possessed also a wide knowledge of mathematics and philosophy. He was the teacher of Teseo Ambrogio, subsequently professor of Oriental languages at the University of Bologna. In the latter part of his life Joseph met with many misfortunes. An unfaithful servant fled to Constantinople with all his savings. Joseph pursued him thither, but was accused by the thief as a spy of the pope, and had to seek safety in flight. During the siege of Rome in 1527 Joseph was attacked by four robbers. He succeeded in escaping; but while endeavoring to reach Vicovaro he was stricken with the plague. Refused entrance to the city, he died without assistance in the open field. Vogelstein and Rieger, Geschichte der Juden in Rom, ii. 85 and Index. See Jew. Encyc. xi. 31b.